Back-to-school is an exciting time for kids and parents alike. But around mid-August, the back-to-school advertisements start popping up – suddenly excitement turns to panic about all the things that need to get done and those that might get forgotten. But don’t worry… we’ve put together this back-to-school handbook with everything you need to make this school year a tremendous success. Download the entire handbook here or by clicking on the above image (right-click, save as)! As a mom or dad, you’re equipped to handle a lot, but for back-to-school time there’s so much to remember and even heroes need a bit of help. 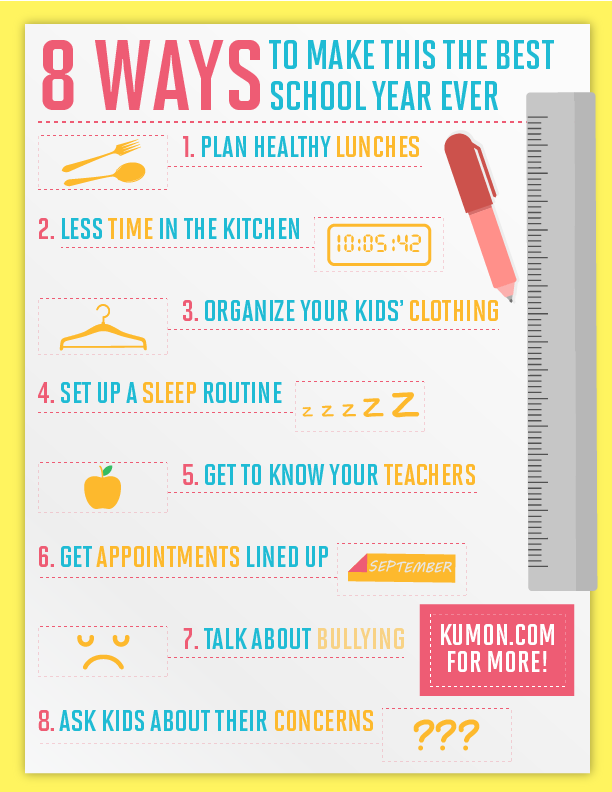 Here are a few ways to make this the best school year ever. We’ve all done it – thrown together a few things last minute for our kids’ lunch. We won’t shame you. But having a well-fed and energized child is key to making the school year as fruitful as it can be (pun intended). You can plan out a weekly or monthly meal schedule or you can simply compile a list of options by food group so you can pick and choose as you go. If you are stuck for ideas, check out this article with lunch ideas from celebrity chefs! While you’re planning for lunches, why not think about weekday dinner ideas. One great way to save time during the week is to cook meals on the weekend and freeze them for the week. Rather than buying a ready-made lasagna or shepherd’s pie, you can make your own and then pop it in the oven the day of. Before freezing your fresh meat, cut and season it before packing it up in the freezer. For fresh produce, you can dice up vegetables for a stir-fry or steaming so they’re ready to go when you need them. Some of us must remember going to school in some awful outfits! Neon purple and pink jump-suits anyone? To keep it simple, set your child up with a selection of outfits that can be rotated throughout the week. This way, your child will be looking sharp, feeling smart and well on their way to having a great school year! Here are some great outfit ideas from Teen Vogue for girls and Parents.com for boys. One of the biggest challenges can be the sharp shift from lazy summer to busy fall. It’s very important to have your kids on a good sleep schedule, especially if you consider research that suggests a well-rested child performs better in school. A sleep routine is something that can be established in advance of the school year, however. Get your kids counting sheep at a decent hour starting in August and you can look forward to a much more relaxed transition. Do you ever wonder who your kids are spending their days with? Well who can blame you? A little communication can go a long way in parent-teacher relationships. Don’t wait until the first parent-teacher conference to connect – to start, you can send an introductory email to give them a little background on your child. To start, when was the last time your child saw their pediatrician? Check their immunization record to be sure they’re up to date, as many school require it. Has your child been to the dentist in the last 6 months? It might be time. And if they haven’t yet had their vision checked, it might be a good idea to schedule an appointment with an optometrist. Difficulties in school can arise simply from not being able to see the board clearly. Make time to shop for school apparel and winter gear, and don’t forget to plan for haircuts. Research shows that 1 in 3 kids experience bullying at some point in their education. With social media, there are even more opportunities for bullying. Make an effort to talk to your children about how to recognize bullying. For example, do they know the difference between teasing and bullying? Talk about some of the things they can do to handle different types of situations. And although we don’t like to think that our kids would bully others, make sure they know the right way to treat their peers so that they don’t find themselves heading down that path. Make sure you take some time to discuss what your kids are looking forward to and worried about this year. Going back to school can elicit mixed emotions and anxiety can manifest in numerous ways; from nightmares and difficulty sleeping to “tummy aches” or a sudden renewed interest in a security blanket. Sometimes just talking about it can help alleviate some of the stress. Summer is coming to an end. It’s time to get back to school – but the transition can often be difficult for both kids and parents. As parents, we do so much for our kids, but we often overlook the fact that our kids can do so much for themselves! 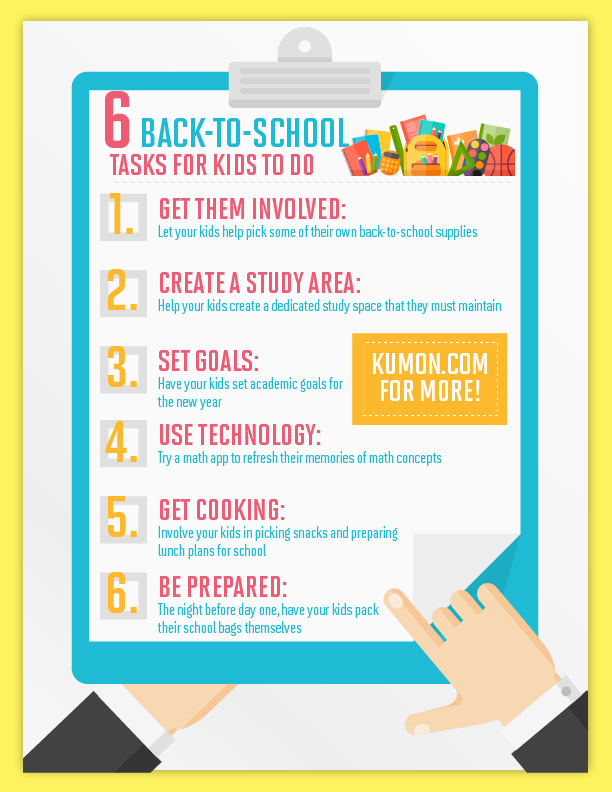 We made a list of back to school tasks to empower kids to take charge of their own back-to-school prep. Love it or hate it, you’re going to have some back-to-school shopping to do. If you develop that nagging feeling that you’re forgetting something, you can consult the lists that we’ve lovingly prepared. News flash: not every child is excited about math. Parents often respond to this sentiment with acceptance, thinking “well, I guess that just the way it is.” But maybe there’s another way to approach this. Just as you would psyche-up a child before a sports game, it makes sense to work with your kids to get them thinking about math the right way. You never need to do it all by yourself. Never has this been easier than with today’s ease of access to technology. There are plenty of great math apps out there for kids to choose from. Keep kids interested by choosing either one great app that they love or by exposing them to a few different apps every once in a while. The challenge can be addictive. Soon, they will form the habit of playing with math apps without your intervention. Congratulations: you will have achieved the seemingly-impossible – a love of math in your children! Parents chat with one another about all kinds of things related to kids. There’s no reason you couldn’t get their insights into dealing with math struggles too. Maybe your friends have been through similar struggles to get their kids interested in math? Maybe somebody you know found a way to help their kids advance beyond grade-level? Bounce ideas off one another and explore the possibilities. Practicing math skills doesn’t need to be boring. A day-to-day approach might be helpful in getting your children to enjoy math more and feel more comfortable doing it. Applying this principle can be quite simple in practice. Depending on how old your child is, you can ask them to help you with things like baking or cooking. Even a trip to the grocery store gives an opportunity to practice math. How about a game of “guess how much” every time you go through the check-out? It doesn’t take much to ignite the spark of math inside a child’s mind! It could be that your child just needs a little validation. If they’re feeling discouraged, try telling them about your own experience with math. Maybe you’ve had your own eureka moments in the past? Share those with your kids and let them know that math is a struggle for a lot of people, but that the journey is worth it. Math can make kids feel a bit overwhelmed at times, so if one motivational technique hasn’t worked, don’t be afraid to try something new. If you’ve been following our advice, then surely you’ve been trying to get your kids nose deep in as many books as possible. Now that back to school time is approaching, there’s a new challenge: how to keep the reading momentum going? Here are 7 tips to help keep reading fun for your kids going forward for the whole school year. Choose a book that your kids like and read it together. Simply take turns with them reading aloud. Depending on their age and skill level, you can take turns reading lines, pages, or entire chapters. You’ll want to try to find the “just-right” level of difficulty when doing this exercise. This takes into consideration the frequency of sessions and the difficulty of vocabulary and subject matter. Remember, learning isn’t a race. This exercise is about having fun and making memories together. Remember that physical place full of books that you thought nobody went to anymore? Despite their recent dip in popularity, libraries are still a great resource for kids. They represent easy access to a world of books – literally! Plus, you can save on the cost of buying books. Make a habit of visiting the library with your kids and set a good example by enriching your own knowledge through reading as well. Bend the rules a bit sometimes! If the book your child is reading is holding their attention, let them dive deeper. Harness the energy of enjoyment as much as you can (within reason). If your child really doesn’t like reading no matter what you try, they could have a learning disability. First, if this turns out to be true, do not fret! There are many experts who are aware of a growing body of knowledge on childhood development. Engage with your teachers first then check with some recommended specialists or your family doctor. Certainly, some books are “better” than others. As parents, we may even have our favorites. But just because you loved Curious George doesn’t mean your children will. When it comes to reading, always harness the power of excitement. If a book appeals to your children’s sensibilities, the pages will turn, vocabulary will increase and their aptitudes will increase across the board. It doesn’t need to be a full-blown in-house library, but a dedicated corner or nook can go a long way towards helping kids develop the habit of reading. You can fill this space inexpensively by picking up used books from garage sales, used book stores and even the dollar store. Adding new books periodically and making the space comfortable and inviting will help keep you child engaged! We want our kids to follow to excel. Just like healthy eating habits, exercise routines, and good manners, it’s monkey see, monkey do… or not. If your kids don’t see you reading, it can be difficult to convince them to do so. Be the change you want to see in your kids and pick up a book. You’ll be glad you did. 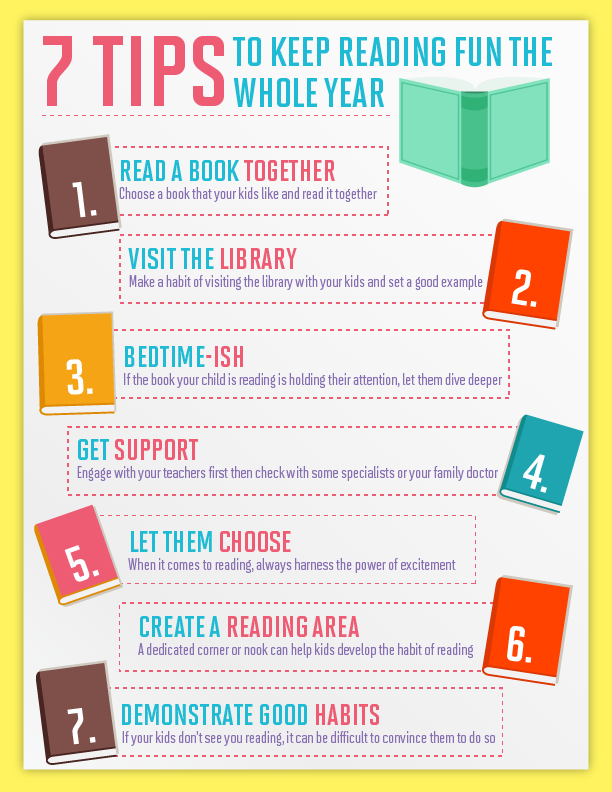 Setting a reading time for the whole family can be a great way to do this. Have a happy school year! Did we miss anything? Let us know your back-to-school tips in the comments section below! If you are looking for ways to give your child an academic boost, you're in the right place! For more information on how Kumon can help your child improve their math skills this school year, visit a centre near you.